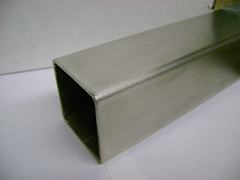 We match or exceed mill-polished finishes on sheet, plate, flat bar, structurals, pipe, and tube. Steel service centers use us to provide their customers with a variety of materials and sizes with unsurpassed finishes. The high-vacuum industry relies on Stainless Polishing Company for pit-free plate and flat bar ready fabrication. Other finishes that can expand your sales and application opportunities include our "pre-plate" or 240 grit and "continuous grain" finishes. Let your customers know that these alternatives are available. We can provide samples of these finishes in coupon form. 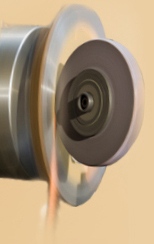 Pre-plate Finish, also known as "240 grit," should be used when a much finer grain is required for more reflection of light, or when subsequent polishing to a No. 8 finish is planned. The pre-plate finish is achieved by extra passes with a finer grit belt to remove the still obvious grain structure of the standard No.4 finish. Continuous grain finish is a No. 4 finish with the added texture of a long scratch pattern. This is available only on plate or sheet processed on our Hill-Acme sheet-polishing machine. Our process breaks up the dull uniformity found in the satin-like standard No. 4 finish. Our proprietary plate polishing machine was designed and built by Stainless Polishing Co. to accomodate No. 4 finished plate extended to 8' wide. When your customers demand finished plate wider than 50" we use this gantry-type reciprocating plate polishing machine. A 6" wide belt traverses the plate back and forth in an 8' long stroke. The grain will run perpendicular to the length of the plate if the plate is longer than 96". This machine is capable of polishing a minimum thickness of 3/16". This is not an "architectural grade" finish. We finish plate up to 48" wide on our Hill-Acme machine, still the most economical method for producing the best finishes. Smaller sizes are grouped together on the Hill-Acme and run as a lot under the contact roll. In this way we take advantage of our large capacity and horsepower. No 4 or better finishes can be put on stainless, copper, brass, and aluminum plate (3/16" and heavier), provided the plate is flat enough to permit contact as it goes through the grinding and polishing equipment. We regularly process plate on one side or two sides to our "pre-plate" (240 grit) and "continuous grain" finishes. These premium finishes are available only on plate under 50" wide. Fax or telephone your request for a quotation, or visit our plant and inspect the process. We believe you will find it fascinating.